Commercial & Residential Waste Disposal Gunnersbury W4 | RDA Cleaning & Maintenance Ltd.
You have some rubbish that you need to be taken care of? Don’t worry we have it covered. RDA Cleaning & Maintenance Ltd. is a professional waste disposal company, specialized in rubbish removal Gunnersbury W4 services. All the services that we provide are great for both residential and commercial clients and are in accordance with the British waste management requirements. Our vetted professionals do their best on the job. That means that our company can guarantee you a high-quality service thanks to them. But not only are our service of the highest quality, they are at affordable prices as well. Our high quality waste disposal service in Gunnersbury W4 is a complex procedure with specific chores and actions to handle depending on the property and the junk type we face. In all cases, we promise to execute the service fast and safely. Once the service is arranged for you, expect urgent visitations by our expert and trained technicians. They come to your property for a check in advance. According to the volume and the type of the rubbish, we provide you an offer and free quotation. A plan for the entire service is also offered to the customer. Once you agree, we get ready to remove your junk as soon as possible! All of our workers are insured, trained and professional. Our professional rubbish collection Gunnersbury W4 services combined with the experience are one of the fastest and safest ways of getting rid of that rubbish that has been piling for a while. The company collects all types of rubbish. The first thing we do is sending a team which will evaluate the volume and weight of the things that have to remove. They will tell the resident the price that the service will cost. the customer. If they agree on it than our vetted workers can begin straight away. After everything is gathered they will then transport it to the nearest dumpsters or recycle area. For the purpose of being efficient to the maximum one, a team will use one dumpster or recycling area. All our waste disposal Gunnersbury W4 services will be done in the most discrete manner without the need of stopping your work. We also provide construction waste services that include builders clearance and removal of refurbishment waste. So if you wish to contact a company that knows what it’s doing, get in touch with RDA Cleaning & Maintenance Ltd.. Please give us a call at 020 3404 1646 or use our online booking form and we will come to help you out. 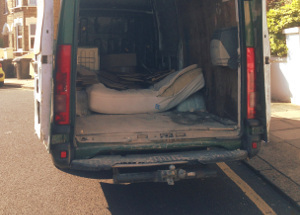 Get a free quote on our quality rubbish removal services Gunnersbury W4. The nearest tube station serving W4 Gunnersbury is Gunnersbury.